As you may know, I’m currently writing a book about metadata for the MIT Press, which will be part of their Essential Knowledge series. The current plan is that the book will be on in the Press’ Fall 2015 catalog. Just in case you want to, you know, buy a copy. So I’ve been thinking about metadata a lot, and doing a lot of metadata-related research. One of the things that I like to do, when I’m conducting research, is to try to get a feel for the history of the thing I’m researching. So I will often go digging through citations, trying to find earlier and earlier examples of the phenomenon in question. I believe firmly that to understand where we are, you have to understand how we got there, especially in the social sciences. My students have been putting up with this idiosyncrasy of mine for years now. But I have to admit, while this scratches my itch for context, I’m not sure it really informs my work in a significant way, most of the time. Until now. Naturally I tried to get my hands on copies of the publications listed in this entry. Because I’m just that big of a geek. Unfortunately, I was not able to find a copy of the Proceedings of IFIP Congress 1968 online. The 26 June 1970 issue of the Coshocton Tribune is online though: check it out. The site NewspaperARCHIVE.com very helpfully provides OCR text of the newspapers they have digitized. Unfortunately, OCR is very error-prone. The OCR text of this issue of the Coshocton Tribune says just what the OED says it does: “…illegally gained information from the computer system of Metadata Computing Inc. of Louisville, Ky.” Not satisfied though, I zoomed in on the image of the newspaper page itself. Because I’m just that big of a geek. And I swear, I almost fell out of my chair. OMG, I've just discovered an error in the Oxford English Dictionary. 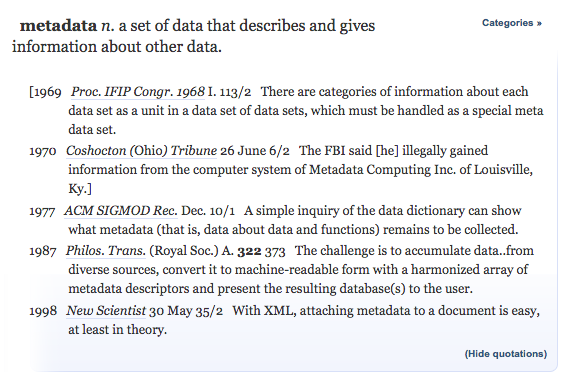 The 1970 entry for the word "metadata" is incorrect. Well, now I had a mystery on my hands. I investigated Metridata Computing, to see if I could find any information about that company. And I found this entry from Businessweek on George Fischer, founder of Metridata Computing, Inc., and I found the text of this speech given at the University of Louisville, introducing George Fischer and mentioning Metridata Computing, Inc. Well, that was enough to convince me that I was reading the newspaper print correctly, and that Metridata Computing was really a thing. Apparently it was enough to convince the OED editors too. I submitted a correction to the OED, of course. They have a submission form. Of course they do; the OED owes its early existence to user contributions. But I couldn’t stop there. I had just told the OED that one of their entries was incorrect. As a good information professional, I felt compelled to replace it with a valid entry. Because I am, as previously mentioned, just that big of a geek. So what do you do when you’re digging into etymology? Back to the 1960s? Go to Google Books, of course. Search on metadata, custom range 1960-1969. This search produced quite a few false positives: maculata, in particular, cropped up frequently. 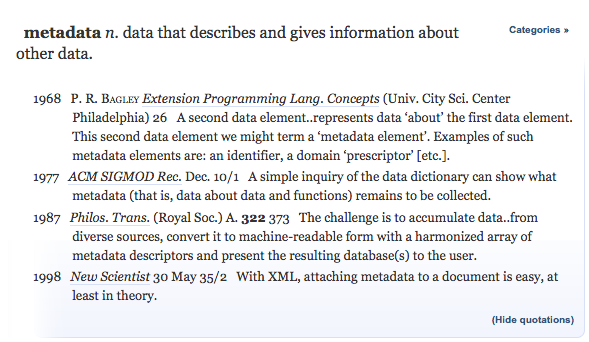 But after looking at a lot of snippets (a lot of snippets)… I was eventually able to identify the earliest real occurrence of the word “metadata” in the Google Books corpus, in the report Extension of Programming Language Concepts, by Philip R. Bagley. Actually neither the full text of this report, nor even a snippet, is available on Google Books. But I was able to find a copy online, here. I submitted this to the OED too, of course. I never got a reply from the OED. But then I didn’t really expect to. They must have tons of these submissions to go through. So there you have it. I have found the first known use of the word “metadata” in print. To be fair, it’s really only the first use of the word “metadata” in the Google Books corpus. There may be an older use in print, I don’t know. Where did Bagley get the word “metadata” from? Did he make it up or was he using someone else’s term? I don’t know, though it sure looks like he invented the term for this report: “metadata element” is in quotation marks, as neologisms often are, and it’s clearly derived from the term “data element,” which he uses throughout the report. Still, I have a nagging suspicion that the term predates Bagley. But whatever! I found the first known use of the word “metadata” in print! I made a contribution to the OED! I feel so special! Surely this should count as a significant contribution to the scholarship of my profession? Update: Damnit! Apparently the internet knew all about Bagley years before I did. See this and this. Oh well; I still made a contribution to the OED.